HAMAMATSU, Japan, Oct 27, 2016 – Roland DG Corp., a leading manufacturer of wide-format inkjet printers and printer/cutters worldwide, today announced that its recently introduced Roland VersaWorks Dual RIP and print management software now supports several additional Roland DG inkjet printers and printer/cutters. Roland VersaWorks Dual builds upon the intuitive, easy-to-use capabilities of Roland VersaWorks to provide high-quality printing while adding enhanced processing and editing functions. Yuko Maeda, division president of Roland DG business development unit notes that Roland VersaWorks Dual enables users to work not only with PostScript files, but also allows for native processing of PDF files, which have become popular in the field of commercial printing, to ensure transparency effects are processed accurately. In addition, white and clear ink layers can be generated automatically in the RIP, ideal for use in producing transparent window graphics, stickers and personalized accessories with special effects. 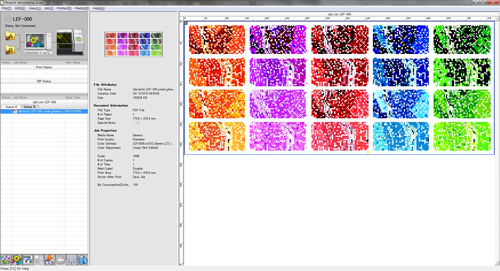 Features like offset, positioning, rotation and registration of ink layers can be easily configured in the RIP as well, without the need to return to graphic design software. Roland DG Corp. is a leading manufacturer of products designed to help professionals and hobbyists transform their imagination into reality, including SOLJET, TrueVIS, VersaCAMM, VersaUV and Texart series large-format inkjet devices, MDX milling and EGX engraving machines, CAMM-1 and STIKA vinyl cutters and MPX photo impact printers. In 2010, the company entered the healthcare market with Easy Shape DWX milling machines designed specifically for creating high-quality dental prosthetics. Roland DG also recently introduced the monoFab series of desktop 3D printers and milling machines for rapid prototyping and manufacturing. The company uses its proprietary cell production technology to manufacture products that are distributed worldwide.